Facebook has released a new version of its iPad app, introducing a new sidebar that encourages users to check out popular games and trending news topics. The latest update, available to download now, adds a column on the right side of the screen similar to the one which on the Facebook.com website. As well as games and news, users will also see calendar events and the weather within the sidebar. 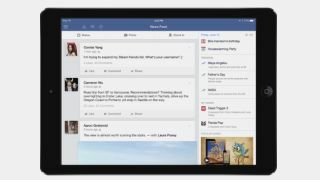 Facebook said the update is being made to provide content relevant to how people use tablets today. According to the social network, 70% of all iPad owners used their tablet to play a game on Facebook over the past three months. Those stats are surprising if true, and it makes sense that Facebook would hope to capitalise on this activity by pushing titles from its developers rather than users going elsewhere to download games from the App Store. The update appears to be US-only right now. Let us know if it's appearing at your end.